'Well, that got my attention. But not in the way they likely hoped. Any personal embarrassment AMI could cause me takes a back seat because there's a much more important matter involved here,' explained Bezos in a post on Medium. OK, back to their threat to publish intimate photos of me. I guess we (me, my lawyers, and Gavin de Becker) didn’t react to the generalized threat with enough fear, so they sent this. 'These communications cement AMI's long-earned reputation for weaponizing journalistic privileges, hiding behind important protections, and ignoring the tenets and purpose of true journalism,' wrote Bezos. In a subsequent email, an attorney for American Media outlines a proposed agreement, which was also published by Bezos. A full and complete mutual release of all claims that American Media, on the one hand, and Jeff Bezos and Gavin de Becker (the 'Bezos Parties'), on the other, may have against each other. 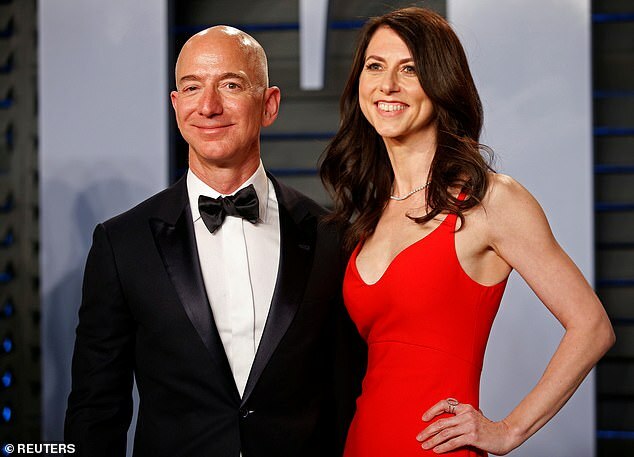 A public, mutually-agreed upon acknowledgment from the Bezos Parties, released through a mutually-agreeable news outlet, affirming that they have no knowledge or basis for suggesting that AM's coverage was politically motivated or influenced by political forces, and an agreement that they will cease referring to such a possibility. AM agrees not to publish, distribute, share, or describe unpublished texts and photos (the 'Unpublished Materials'). Jon Fine, the lawyer who wrote the terms of the deal, worked under Bezos at Amazon for nine years according to his LinkedIn page. He was employed as a lawyer, director and vice president at Amazon between 2006 and 2015, he writes on his online profile. The third and final email shared by Bezos was far more clear about the deal. 'As I advised previously, we stand by the legality of our newsgathering and reporting on this matter of public interest and concern. 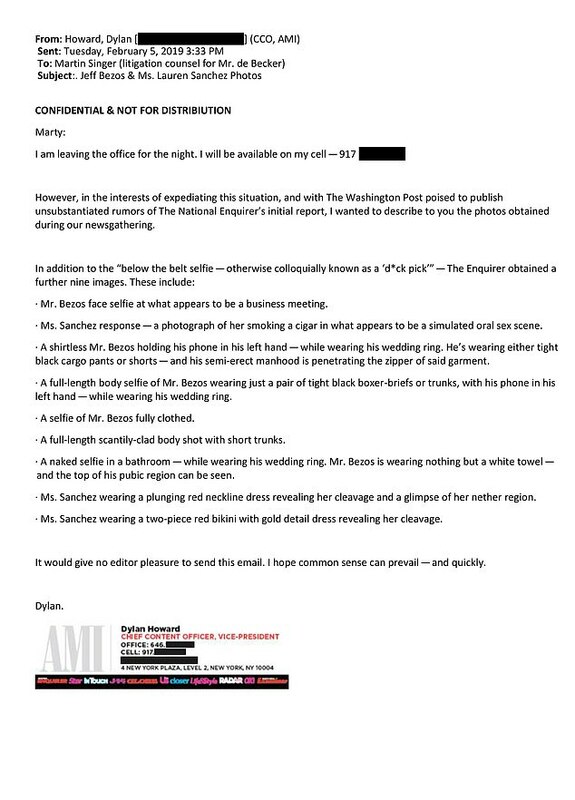 Moreover, American Media is undeterred from continuing its reporting on a story that is unambiguously in the public interest — a position Mr. Bezos clearly appreciates as reflected in Boies Schiller January 9 letter to American Media stating that your client 'does not intend to discourage reporting about him' and 'supports journalistic efforts,' read the email. 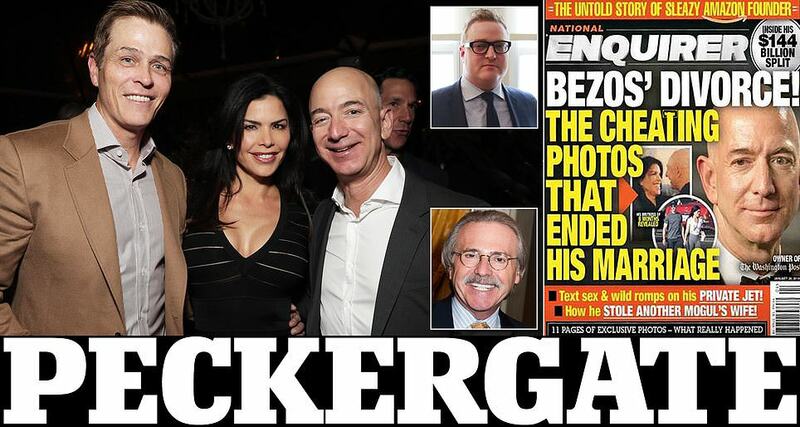 Bezos had hired Gavin de Becker to look into who leaked the images and text messages he and Sanchez had exchanged over the past year. 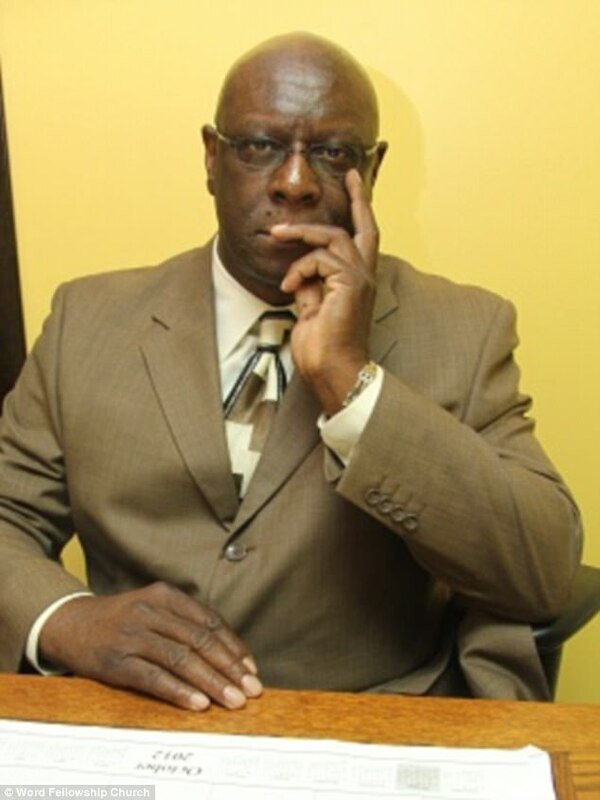 De Becker allegedly suspects that a 'government entity' could have gotten hold of the messages. Washington Post reporter Manuel Roig-Franzia said live on air that de Becker had given 'interesting insights into the backstages of this whole drama'. 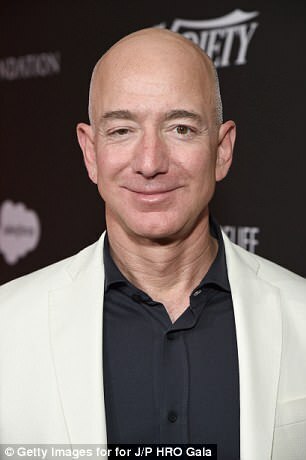 'He does not believe that Jeff Bezos's phone was hacked - he thinks it's possible that a government entity might have gotten a hold of his text messages,' he said. 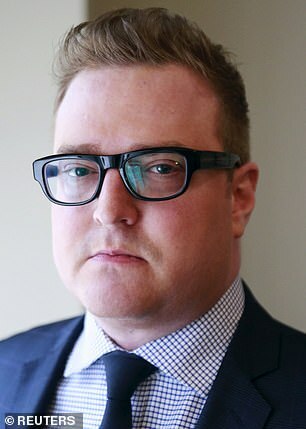 In interviews with both The Daily Beast and The Washington Post, de Becker stated his belief that Sanchez's brother Michael could have leaked the information. Michael is pro-Trump, friendly with both Roger Stone and Carter Page and learned about his sister's affair in April of last year. Those facts came not from de Becker, but Michael himself in his own interview with the Post. 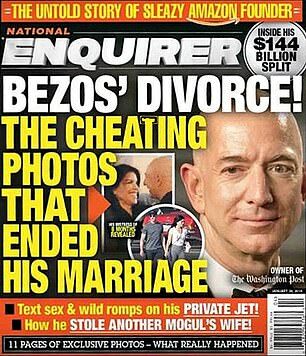 It was not who leaked the news, but why it was leaked that seemed to be of concern to David Pecker and American media, claims Bezos. 'Several days ago, an AMI leader advised us that Mr. Pecker is 'apoplectic' about our investigation. For reasons still to be better understood, the Saudi angle seems to hit a particularly sensitive nerve,' explained Bezos. Last night Lauren Sanchez's estranged husband, Patrick Whitesell, was seen on a date in West Hollywood with model Keira Alexa as the row erupted. Pecker's ties to President Trump and Saudi Arabia were detailed in an March 2018 report in The New York Times. 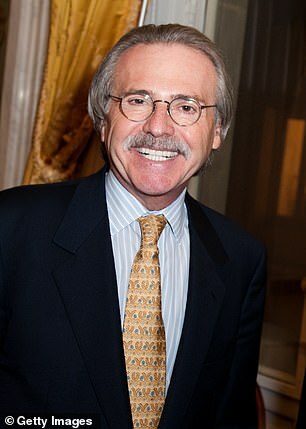 It all began with Pecker being introduced to Kacy Grine, a French businessman with strong ties to Saudi Arabia. That introduction was orchestrated by Ari Emanuel reported the Times. 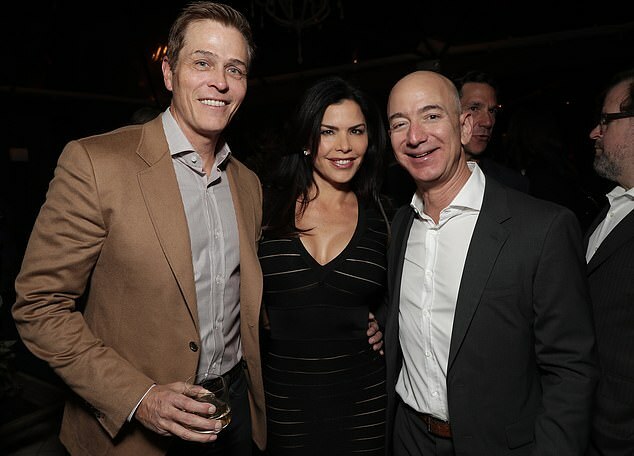 That was a year before the affair between Bezos and Sanchez began, but it should be noted that Emanuel's business partner is Sanchez's estranged husband Patrick Whitesell. 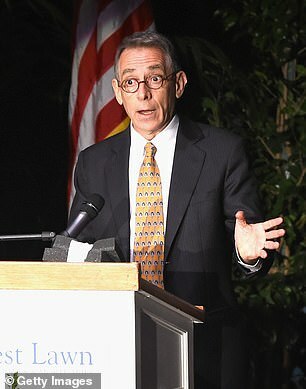 Pecker and Grine reportedly discussed the business landscape in the Middle East, and soon the publisher began making investments in the region. 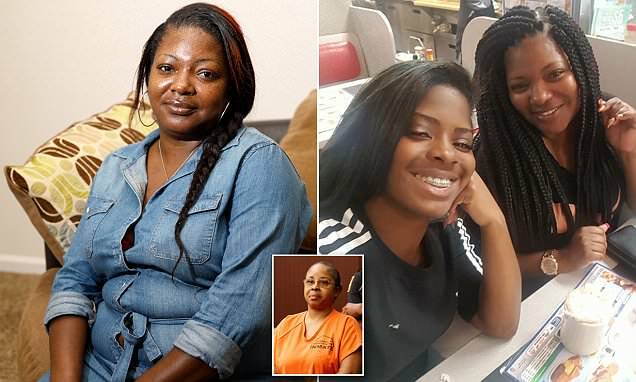 The two men grew close, and when Pecker was invited to see his friend in the White House in July of 2017 he brought along Grine as his guest. After meeting with the president and his son-in-law Jared Kushner, the group went to dinner according to the Times. News of this meeting made its way back to Saudi Arabia, and Pecker was soon viewed as a businessman with an enormous amount of pull and power thanks to his ties to the current administration. In September of that year, Pecker was in Saudi Arabia meeting with the Crown Prince. That fact was ascertained thanks to a email exchange he had with Harvey Weinstein about purchasing Rolling Stone, a week before the disgraced mogul was outed as a sexual predator by the Times and New Yorker. And in January, Pecker reportedly sought out Saudi investments in his attempt to purchase Time magazine per two sources. 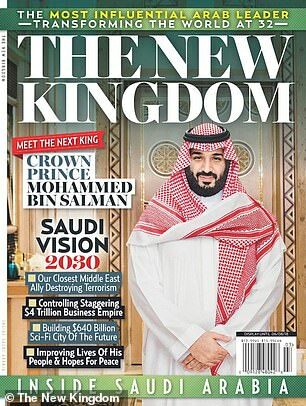 American Media even published a glossy magazine promoting the country that sold for $13.99 and was 100 pages long with no advertisements called A New Kingdom. That magazine made no mention of the human right violations in Saudi Arabia, which have been most closely covered and detailed by the Bezos-owned Washington Post. That coverage has amplified considerably ever since the murder of Saudi dissident Jamal Khashoggi, who was a columnist for the Post. Khashoggi was murdered at the Saudi consulate in Istanbul on October 2 while trying to obtain paperwork for his upcoming marriage to a Turkish woman. An investigation that was carried out by Turkish officials concluded that Khashoggi was killed by a team of 15 Saudis at the kingdom's diplomatic mission. Saudi officials denied these reports for weeks, but after international outcry declared that the murder was the result of a 'rogue' operation. At the same time, officials in Riyadh denied allegations that Crown Prince Mohammed bin Salman was involved in any way with the murder. The New York Times reported on Thursday however that in a wire intercepted by America intelligence officials in 2017, the Crown Prince told an aide he would use 'a bullet' on the journalist if he did not return to the US and stop reporting on the country's violations of human rights. US Intelligence believes that the Crown Prince ordered the murder, as do experts with the United Nations and a majority of both Republican and Democratic lawmakers in Washington DC. President Trump meanwhile has declared very publicly that he stands by the Crown Prince. 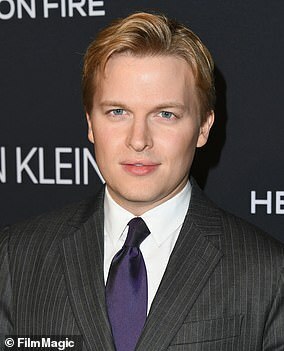 Ronan Farrow claimed The National Enquirer's parent company AMI also sent him threatening emails in a bid to block his reporting. 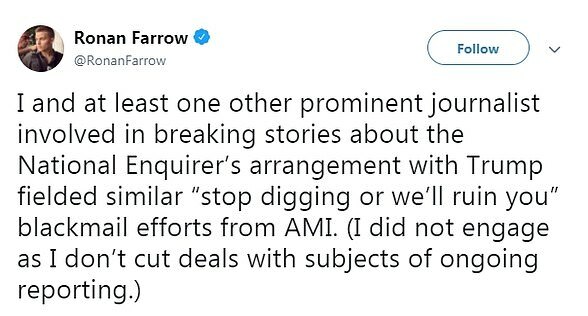 Farrow has written stories on the Enquirer for The New Yorker, including claims AMI's owner David Pecker would kill stories that were damaging to Trump. In another story, he said Pecker ordered reporters to stop looking into claims by a former Trump Tower doorman that the president had fathered a love child in the 1980s. No evidence has ever been found that proves the allegations. 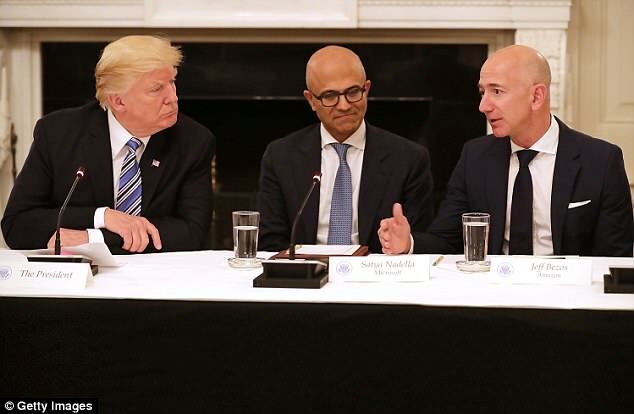 President Donald Trump is 'obsessed' with Amazon owner Jeff Bezos and is plotting ways to 'f***' with his company, sources in the White House have claimed. 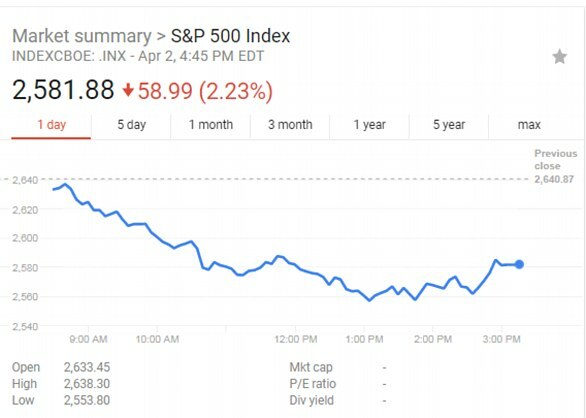 The claims come after Trump's repeated Twitter attacks against the internet giant contributed to a 5.9 per cent collapse in its share price, wiping about $45 billion from its market value yesterday. The president has said the firm is costing the US Postal Service a 'fortune' and accused it of failing to pay its fair share in tax. Trump wants to increase delivery costs for Amazon, a move he previously wished to make before being dissuaded by outgoing economic adviser Gary Cohn. Another plan of attack the president could put into action is the cancellation of a computing contract Amazon has with the Pentagon. He might also push prosecutors in Republican states to investigate Amazon's business practices. 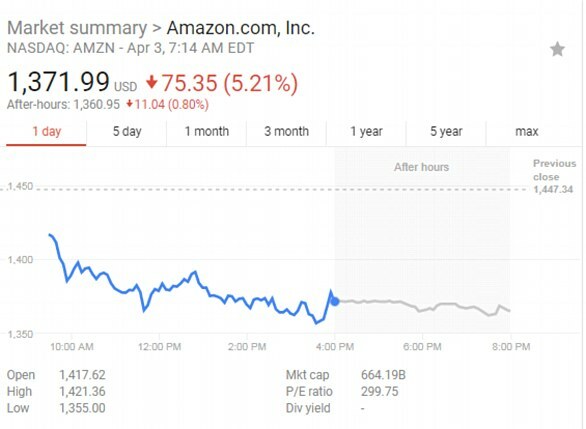 Shares of Amazon.com Inc (AMZN.O) fell 5.9 per cent yesterday after Trump again attacked the online retailer over the pricing of its deliveries through the United States Postal Service and promised unspecified changes. 'Only fools, or worse, are saying that our money losing Post Office makes money with Amazon,' Trump tweeted. Shares of the company fell to $1,362.48. 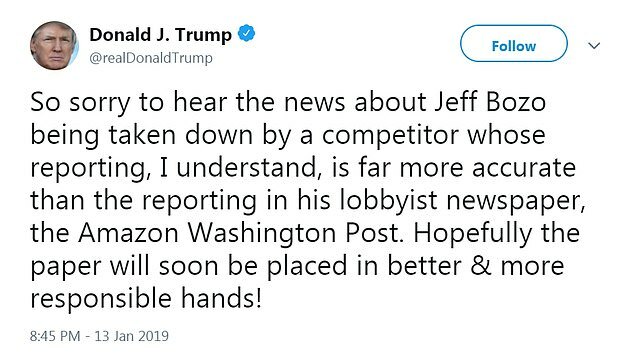 Trump has been vocal about his opposition to Amazon's use of the postal service and Monday's tweet adds to investor worries that the company could see more regulation. Amazon did not immediately respond to requests for a comment. The U.S. Postal Service (USPS) in November reported a decline in annual revenue, hurt by a drop in first-class and marketing mail, offset partly by an increase in package delivery. The postal service has also been posting losses mainly because of payments, more than $5 billion a year as mandated by Congress to prefund the service's future retirees' healthcare. The passage of postal reform legislation could alleviate USPS's pension obligations, give it more pricing power and allow the agency to be more competitive, analysts said. 'We believe the U.S. Postal Service (USPS) has gained share from Amazon which is helping the USPS stay afloat,' Morgan Stanley analysts wrote. 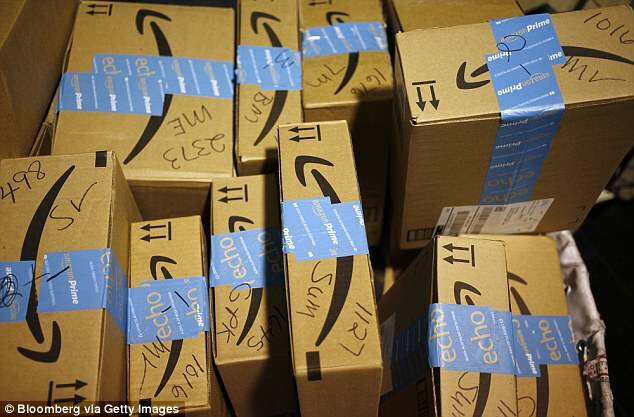 Details of Amazon's payments to the USPS are not publicly known, but some Wall Street analysts have estimated it pays the postal service roughly half what it would to United Parcel Service Inc (UPS.N) or FedEx Corp (FDX.N) to deliver a package. 'President Trump's comments are consistent with industry sources we have spoken to in the shipping industry, who often label Amazon's deal with the USPS as a sweetheart deal,' DA Davidson analyst Tom Forte wrote in a note. 'An argument, however, could be made that the USPS was losing billions before it expanded its service offerings for Amazon and would, still, likely lose billions if Amazon discontinued its use of the USPS tomorrow,' Forte said. 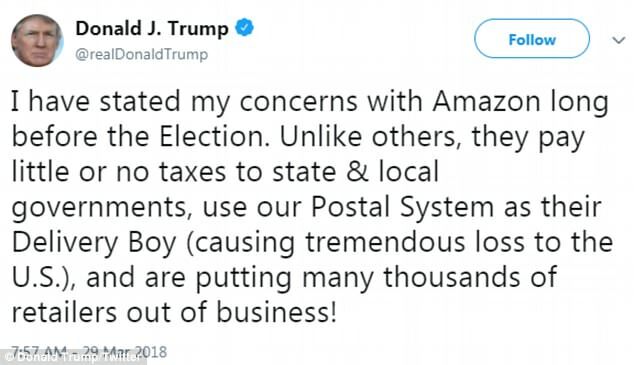 Trump last Thursday accused Amazon of not paying enough tax, making the postal system lose money and putting small retailers out of business. The markets suffered on Monday as a result of a widespread sell-off which saw the S&P 500 plunge to below its 200-day moving average after a gloomy morning start which was the worst second-quarter kick-off since the Great Depression. The S&P 500 closed on Monday at 2581.882, eight points lower than the 2,589 average it has maintained for the last 200 days and reaching its third lowest close of 2018. The sharp 2.2 percent decline is the worst since 2.5 percent decline 89 years ago and is a sign that more grief is in store, at least temporarily. 'We've broken it, and we're sitting below it, which shows real selling, and the longer we stay below, the more probability we at least test the Feb. 9 low at 2,530-ish,' Scott Redler, partner with T3Live.com, told CNBC. Among the sectors which suffered the greatest on Monday was technology. Amazon's NASDAQ share price fell by 5.21 per cent to $1,371.99, the lowest it has been since February 9 when there was widespread Wall Street disruption. The latest decline followed an attack from President Trump on Twitter on Sunday. Intel also suffered (-6.07 percent) and Facebook (-2.275 percent) is still a long drop from its pre-Cambridge Analytica scandal high. 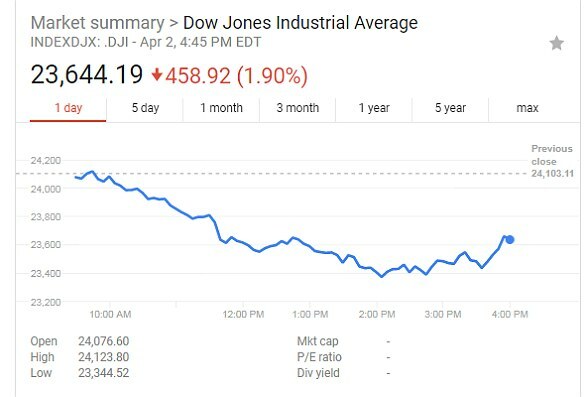 The Dow was also down. It closed at 23,644.19, 1.9 percent lower than on Friday and its second lowest this year. The turn cannot be attributed to industry alone and is, according to experts, an American problem. 'If I look at the global markets, it's really just the U.S. falling apart. 'It feels to me it's a U.S.-concentrated thing, which makes me think it's not as much related to trade as it is to technology and maybe regulatory headaches for some businesses coming out of D.C,' Jeff Kleintop, chief global investment strategist with Charles Schwab, told CNBC. His expertise correlates with Trump's latest proclamation to change the 'unlevel playing field' between tech giants and brick-and-mortar businesses. 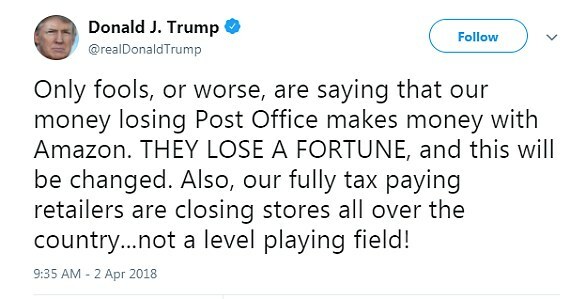 On Sunday, the president tweeted: 'Only fools, or worse, are saying that our money losing Post Office makes money with Amazon. 'THEY LOSE A FORTUNE, and this will be changed.